Drivac pump packages provide reliable oil-free pumping from atmospheric pressure to the 10-6 Torr range. All components were selected based on ruggedness and reliability as the primary criteria. Operation is fully automatic and interlocked, and these packages are not adversely affected by operator error or power failure. Rugged, industrial-grade, 3-stage diaphragm pump. Automatic roughing valve and bypass manifold are included in the basic pump package. Drivac VACUUM-MONITOR sensor and circuit automatically control molecular drag pump operation. Modular design provides for remote mounting of control module and/or direct mounting of the molecular drag pump to user's system flange. Drivac packages virtually eliminate starting problems of ion pumps by providing fast roughing to the 10-4 Torr range and below. The 16 cfm pumping speed curve of the molecular drag pump extends to the 10-6 Torr range. Users report extended cathode life resulting from starting their ion pump at reduced pressures. Because DRI-2 packages contain no oil, they eliminate the need to vent the turbo in power-off and/or power-failure situations. In UHV-grade systems, providing a backing pressure of 10-5 Torr for the turbo extends the useful pumping speed range of the turbo resulting in lower base pressures. In RGA sampling system applications, users report dramatically reduced water levels in the sampling manifold compared to oil-sealed backing pumps. 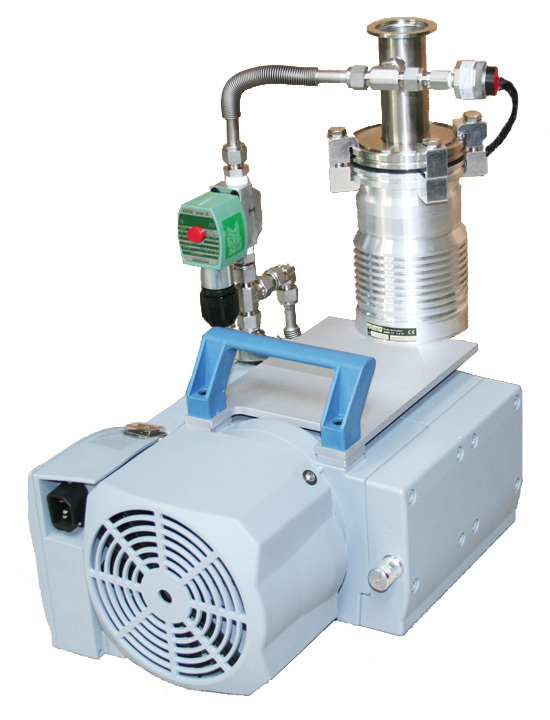 The VACUUM MONITOR sensor and circuit incorporated into all Drivac packages automatically controls operation of the molecular drag pump. The VACUUM MONITOR prevents extended operation of the MDP at high pressures. This results in a lower operating temperature of the molecular drag pump compared to competitive pump packages using timers or force-start designs. The footprint of the BH2-200A is 12" by 12". The pump package weighs 38 lbs. and the standard control module weighs 4 lbs. Carrying handles are attached to the pump package. All Drivac packages are air cooled, and they do not require liquid nitrogen, bake-out, or cooling water. The only utility required for the BH2-200A pump package is 110V, 5 amps. When the molecular drag pump is at rest or at less than full RPM, it creates an impedance in the vacuum line. This impedance can be significant if the system volume exceeds 100 liters. The BH2-200 includes a bypass line and valve for roughing around the drag pump during initial pumpdown. The Drivac VACUUM MONITOR automatically controls the opening and closing of this valve. All vacuum fittings are 304 or 321 stainless steel. Each pump package is thoroughly tested prior to shipment. As a final pre-shipment test, an RGA analysis is performed to assure freedom from hydrocarbons. A print-out of the RGA analysis is included in the manual with each BH2-200A pump package. The standard control module is a half-rack, totally enclosed unit 8.37" wide x 3.5" high x 10" deep. It can be rack mounted or used as a free-standing control box. The standard control module includes a lighted main power pushbutton, an hourmeter, and LED's for indicating the molecular drag pump status. This half-rack unit is 8.37" wide x 5.25" high x 14" deep. It has the same features and characteristics as the standard control module plus a built-in Granville Phillips Convectron gage. The Convectron gage monitors pressure fron 760 Torr to 1 x 10 -3 Torr.